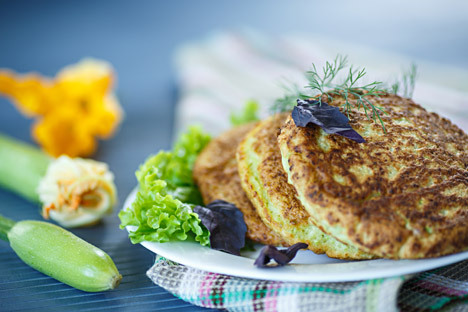 These pancakes, which are ideal for breakfast or even as a snack, are thicker than bliny and are usually made with zucchini or squash. I think it’s no secret that Russians love pancakes. We have two main types: bliny, the yeast-based thick pancakes and blinchiki, the thin ones that are similar to dosas. My grandmother gets very upset when I mix up the names! Russians also love oladyi, which are similar in concept to bliny, but taste very different – the dough is thicker and more dense, they are usually made with zucchini, squash or apples and baking soda is usually added to the mix make them fluffier. Oladyi make great breakfast food or a snack, they are nice served cold with sour cream or plain yogurt and are popular in summer.